The central rock rat is a medium-sized rodent that weighs 70 - 120 g (2.5 - 4.3 oz). Adults are stocky with thick fur that is yellowish-brown on the upper body and cream or white below. Rock rats can be distinguished from rodents of other genera by their characteristically thickened tails. The central rock rat utilizes a range of habitats from tussock and hummock grasslands to low open woodland on ridge tops, cliffs, scree slopes, hills and valley floors. Its diet consists primarily of the seeds of shrubs, forbs and grasses, with leaves, fern sporangia and insects being consumed in smaller quantities. The central rock rat is believed to be nocturnal. 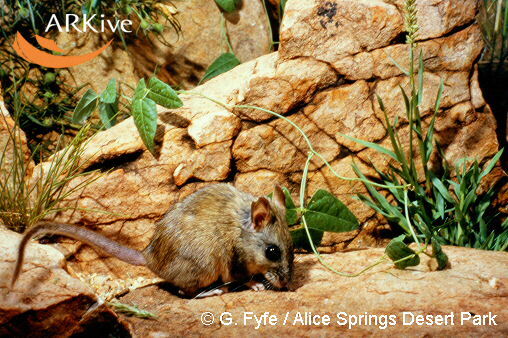 The central rock rat is endemic to the arid southern portion of Australia’s Northern Territory. It was first scientifically described in 1896. No records had been obtained between 1970 and 1995, but it was rediscovered in 1996 and is now known from 14 sites scattered over a 77 km (48 mi) length of the MacDonnell Ranges west of Alice Springs. The full range of its current distribution is unknown. There is concern over the status of the central rock rat because its populations are fragmented and its density is low. No specific threats have been identified to date. *** Despite the central rock rat having been first described over 100 years ago, almost nothing is known about its life history or ecology (Cole 2000) . *** Rock rats are known to lose their tails, fur and skin very easily and are, therefore, difficult to handle (Cole 2000) . The central rock rat is a medium-sized rodent weighing 70 - 120 g (2.5 - 4.3 oz) (Pavey 2002) . Its head and body length ranges from 108 - 140 mm (4.3 - 5.5") (Strahan 1995) . Juveniles have been captured in the wild in June (Cole 2000) . Captive animals have bred and have had litters of 3, 2, 2, 2, 1, 1 and 4 young (Cole 2000) . The central rock rat is primarily granivorous. Seeds (1 - 10 mm (0.04 - 0.4") in size) of shrubs, forbs and grasses are the main component of the diet, with leaf material of secondary importance. The majority of the plant species identified in the diet are regarded as fire-encouraged rather than fire-sensitive species. The most commonly consumed seeds are from the species Glyceine canescens as well as species of the genera Sida and Solanum. (Pavey 2002) The central rock rat also eats fern sporangia and insects in small quantities (Cole 2000) . The central rock rat is believed to be nocturnal.